The greatest Vibraphone/Balafon duet album in the history of the world. Lansine Kouyate is arguably one of Mali’s premier balafon (West African keyed percussion instrument, similar to a Marimba or Vibraphone) players, which is a little like being one of Canada’s premier beer drinkers. 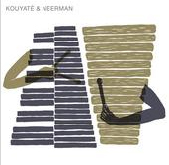 This is a duet album he did with the French vibraphonist David Neerman a little while back, and it’s going to be a while before I take it out of my playlists. To begin with, you’re talking about 2 incredibly rich, but dense instruments, so prepare for your head to buzz for a while. The basses are VERY deep, and the trebles will shriek in your skull for hours. That being said, the dual attack never seems overbearing at all, and it’s always fairly easy to tell where Kouyate’s ostinato starts and Neerman’s melody ends. It’s a beautifully recorded album. It’s also an album with purpose. There are so many albums out there with two melodic lead instruments that just trip over each other, that it’s refreshing to hear two masters actually LISTEN to each other, and work well off of each other rather than just trying to overpower the rest of the group. Not only that, but even though the timbre of each of their instruments is relatively similar, it’s always easy to tell which of them is playing, as both their stylistic approach is quite different. Although Malian music is the starting point of this album, they never stay there for long, and there’s lots of jazz, funk, and psychedelia mixed throughout. In fact, I could see this album appealing to fans of modern funk and jazz more than to traditional “world” music afficionados. It’s a modern groove classic, and fans of the Beastie Boy’s In Sound From Way Out, or the Meter’s Struttin’ records would be well served to give this a shot. Highly recommended for fans of instrumental African music in the mood for something a little different. This entry was posted in Music and tagged Beastie Boys, David Neerman, Lansine Kouyate, Vibraphone, World Music. Bookmark the permalink. Wednesday Comics Woundup – The best book about a mute Sasquatch you’ll read all year. Stupid question from a potentially lazy reader…but what’s the title of the album?